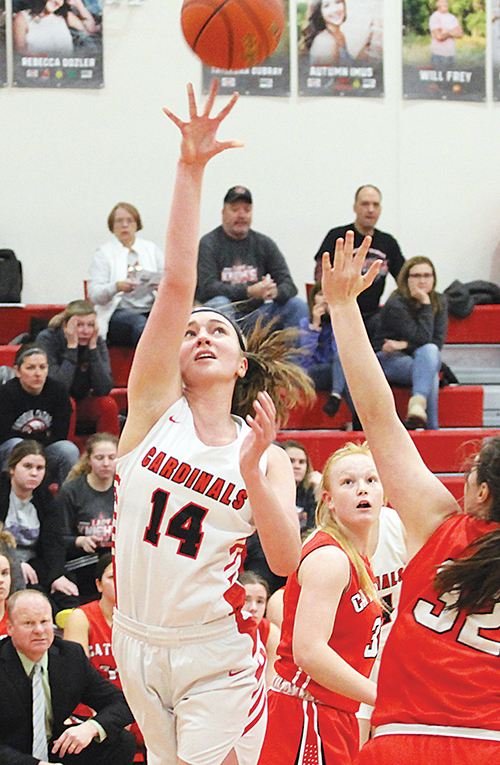 After splitting a pair of contests the previous two nights, the Boone Central/Newman Grove Lady Cardinals opened play in the annual Mid-State Conference Tournament with a play-in game victory over Wayne Saturday. Boone Central/Newman Grove, seeded #8, picked a good time for one of its best performances, blitzing #9 Wayne 61-31 to earn a shot at #1 seed Crofton Monday at Norfolk. BCNG had a solid start, hitting four first-quarter 3-pointers and adding three more long range baskerts in the second period to lead 37-22 at halftime. From there, the Cardinals cranked up their defense, limiting Wayne to just nine points in the second half. “We played our third game in three days, opened the conference tournament, and continued to show great improvement Saturday,” praised Card Coach Andy Imus. “Once again, we challenged the girls to elevate their defensive play and they responded well. “Wayne threw a variety of full and half court defenses at us and the girls handled things well. We shot the ball extremely well, hitting seven first-half threes – three by Kylee Rasmussen and two more by Kelsey Thompson. Kylee had a great night shooting overall and scored 19 points. We had five different girls hit a 3-pointer and they made Wayne pay when they were open. One of the keys to the runaway win was free throw shooting, as Boone Central/Newman Grove sank 21-of-26 (81%) attempts. The Cardinals were also a scorching 8-of-13 (61%) from 3-point range. BCNG (8-8) outrebounded the Blue Devils 37-24, had a 17-4 advantage in second-chance points and forced 18 Wayne turnovers in the contest.